Give me a window seat! I used to think I liked traveling. I've told people this many times. But now that I travel weekly with Hens on Ice, I've learned that I really just like seeing new places. The act of traveling from point A to B typically makes me want to pull out all my feathers and/or cry. But arriving in Stockholm, Sweden today after some cackles and cries, I witnessed something amazing I never thought I'd be alive to see. I've observed many common behaviors in people brought out through traveling. After being through countless airports, my patience for poor travel etiquette and behavior is at zero. We turn into a different breed at airports. Suddenly, people are either aggressive, rude, and impatient, or they act as if they have no concept of how an airport functions. I want all these people out of my way because I want to get to point B so I can say I like traveling. I have many hen peeves on an air travel days, but the worst of it comes at baggage claim since I've already spent the day being peeved. 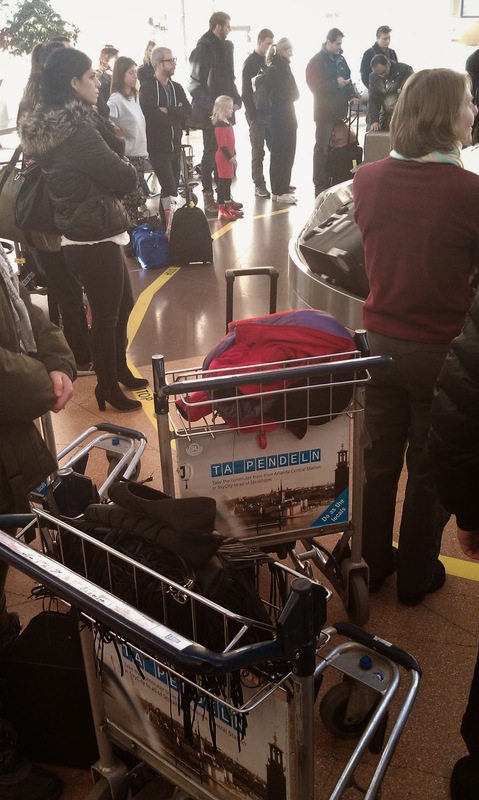 People crowd around the carousel long before there are any signs of movement of luggage. They pack themselves leaning over the edge so tightly as if they'll get their bags sooner or catch scraps of seed. The rest of us behind these aggressive hens no longer have vision of the carousel, so how can I see my bags? Thankfully, I am kind of tall and slightly agile, so I can peer through feathers to try and eye any bags or seeds coming my way. When I see my bag, I have to hendoze through the flock, throwing wings to try and get my bag before it passes me. In the mad dash, I always bruise my wings and others, then usually crush a small chickadee when I lug my hefty bag off the carousel and into the packed flock. Once I find first aid and peel chickadee feathers from the bottom of my bag, I always rant how there has to be a better way! Someone needs to make a rule to prevent all these dumb birds from blocking everyone else from their luggage. Ideally, hens would stand two feet away from the carousel until they see their bag. Then they may step forward. My idea has fallen on deaf ears and terminal police. Today in Stockholm, I saw beauty and brilliance in the airport baggage claim just when I was about to roll my eyes again. There it was, the most beautiful thing I've seen in an airport: order amongst the chaos and crying. Just get your toe off that yellow line, lady.